Adding almonds to your dinner means adding up vitality, numerous health promoting phyto-chemicals, proteins, vitamins, minerals, protection against many diseases such as cancer and a divine taste. Whenever health tips are searched, a daily intake of nuts is always stressed upon by dietitians. Reason is their being rich in vitamins, minerals and many other nutrients that we miss if we skip nuts, such as almonds. Almonds are a good source of dietary fibre and many other nutrients such as phyto-chemicals, mono unsaturated fatty acids that help reducing LDL which is ‘bad cholesterol’ while increase HDL that is ‘good cholesterol’. This peculiarity of almonds is enough to confirm a healthy blood lipid profile, which results in prevention of coronary artery diseases and strokes. 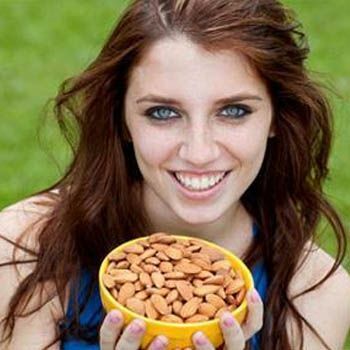 The diet tips promoting balanced diet therefore finger towards almonds. There can be several ways to add almonds to your daily diet, such as dinner. Almonds add a rich and nutty flavour along with a very tempting aroma and a crunchy, crispy texture to the meal they are added up. Following diet tips focus numerous such ways of adding up almonds to your dinner. When talk of almond recipes for vegan dinners, there are for about thousand options, ranging from indian almond recipes to chinese, thai, mexican and many other cuisines. Oriental almond recipes such as mixed vegetable curry, prepared with almond paste and coconut milk not only look tempting and taste divine, rather give enough energy and proteins which vegetarians skip otherwise. In Arab countries, there is a huge variety when comes to almond recipes for vegan dinners. Toasted almonds, other nuts and raisins cooked with rice are not but a heavenly treat. Almond recipes of vegan burgers prepared with almonds, flaxseed, sun dried tomatoes, balsamic vinegar and seasonings are very much liked by kids and adults both. Chicken makes a great combination with almonds and thus we get many almond recipes combined with chicken in several cuisines all over the world. In chinese cuisine, chicken with almonds, whole almonds are used in toasted form, cooked with chicken boneless chunks to give a nice gravy to be served with rice. Ground almonds are considered to be a dream ingredient by all the chefs when deriving new dishes of chicken. Without any deliberate effort, almonds impart protein rich crunch to the dinner platter in which they are added. Ground almonds are combined with tomato sauce and chipotle peppers to make a Mexican mole sauce for chicken. Almond recipes in combination with chicken, we see that almonds are used in different textures, sometimes as whole, sometimes roughly chopped to make a good coating for the chicken fillet and sometimes in the form of a fine paste to make a good gravy. In Oriental dishes, almond recipes with chicken are so many, but the ‘Mughlai Chicken’ – that is chicken curry prepared in almond paste – is the most famous and rich in taste and nutrition. All the health tips point towards a major use of almonds to the daily meals. We hope you would be benefited with our diet tips on ways to add almonds to your dinner!